232Analyzer is an advanced serial port monitor, RS232 monitor, Rs232 protocol analyzer software, debugger,sniffer, it allows you to control, debug, monitor, sniff, test and analyze serial port activities with RS232/RS485/RS422/TTL converters. 232Analyzer allows communication logging (c/w timestamps) between serial devices using serial ports (with optional monitor/control cables and rs232/rs485/rs422/TTL converters), e.g. Modbus, PLC, SCADA. 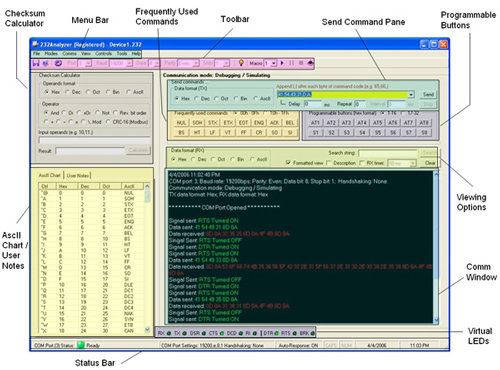 232Analyzer allows you to control serial devices right from your PC. 232Analyzer supports data input and monitoring in Hexadecimal, Decimal, Octal, Binary and ASCII formats. 232Analyzer also allows you to change / monitor RS-232's line states: RTS, DTR, CTS, DSR, DCD, and RI. All data and signal flows are logged in the Communication Window, which can be saved as .txt, .doc or .rtf files for further analysis. Qweas is providing links to 232Analyzer 5.6 as a courtesy, and makes no representations regarding 232Analyzer or any other applications or any information related thereto. Any questions, complaints or claims regarding this application 232Analyzer 5.6 must be directed to the appropriate software vendor. You may click the publisher link of 232Analyzer on the top of this page to get more details about the vendor.